ALS Association invites you on a trail ride in Huntsville to celebrate the life of Janet Glenn and help in the fight to end ALS. For more information, visit www.als-arkansas.org. Enjoy high-flying fun for the whole family at the Art with an Altitude Kite Festival. Bring your own kite or make one on-site with the experts from KaleidoKites. 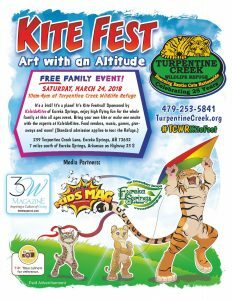 For more details, visit www.turpentinecreek.org.